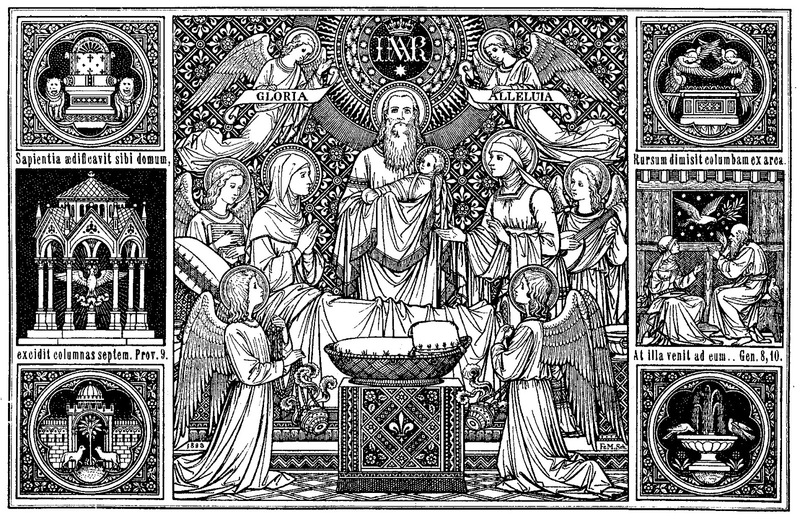 RORATE CÆLI: Fontgombault Sermon for the Nativity of the Virgin: "Near the Cradle of Mary, the Co-Redemptrix." Fontgombault Sermon for the Nativity of the Virgin: "Near the Cradle of Mary, the Co-Redemptrix." The Church invites us today to gather near a cradle. It is quite rare! The little one-day old Virgin has in herself the mark of a unique favour, God’s exceptional gift. Unlike other children of men, Mary ignores the scar of rebellion: she has been immaculate since her conception. As in the very first days, God, when He sees Mary, remembers man as He had created him, and as He still wants him to be. Before Mary, God can say again with full truth that “it is very good” (Gn 1:31). Mary gives thanks, namely, after having received from God, she turns towards Him, and, as it were, gives Him back His grace and His beauty, as she presents Him with them. Humility and greatness, such are the two characteristic features of Mary: true humility, because of the true greatness of the unique gift that she has received from God; true greatness, because of the humility of a life that, although she is Mother of God, takes place as the life of any other mother and housewife in Palestine under Roman rule. Humility again of Mary, whose genealogy is unknown. The Church has adopted for today’s feast the genealogy of Jesus, which goes back from Jesus’ foster father, St. Joseph, to David. Joseph is described as “the husband of Mary, of whom was born Jesus” (Mt 1:16). Humility of Mary, who, while she is still alive, is beatified by her own Son Jesus, not because she has begotten Him, which has objectively earned her an unrivalled glory, but because she has heard the word of God and believed. Mary has remained close to God, and she was associated in a particular way to the work of our redemption, Co-Redemptrix behind the One Redeemer. Her joy is to be close to God, but it is also to exercise her motherhood on the children of men. Whereas you are preparing to make your solemn vows of religion, may your hearts be at one with the heart of Mary! The calling to a radical gift of your lives within the monastery is a sign of a special love of God for your souls. Indeed, from the very first day, God has regarded each of you, He has used the love, the upbringing that you have received, the prayer of your families, and He has done great things to you. In the school of Mary, do not be in turn ungrateful sons; quite the reverse, know how to give thanks, and pay homage to God with your lives. Humility and greatness are also two characteristic features in the life of a monk. “Suscipe me, Domine, secundum eloquium tuum, et vivam. Receive me, O Lord, according to Thy word, and I shall live.” Receive me, O Lord, in Thy house, so that I may dwell near Thee, and live to do Thy works. He is a monk, he who directs his glance towards God alone, who soars in desire towards God alone, who is attached to God alone, who decides to serve God alone, and who, as he is possessed of God’s peace, becomes a cause of peace for others. Radicalism in the quest for God is that which makes a monk. From a man, it begets a witness. Various means are proposed. Reading and meditation of sacred Scriptures hold an important place during the monastic day. A monk keeps his mind and tongue for weighty words, the most true words that have ever been written on earth, the Scriptures, for the solemn recitation of Psalms. He puts into practice God’s commandments in the very concrete framework of brotherly life. Last but not least, how could we not mention the architectural gems inside which his life often takes place, and which are almost naturally conducive to prayer. Greatness of monastic life… but also its humility. This humility urges St. Benedict to advise monks to keep everywhere their eyes fixed on the ground. In several chapters of his Rule, St. Benedict alludes to human miseries, of which there is no lack in monasteries, too. You will therefore remain paupers. Through the offering of your lives, you will carry your brothers and sisters that have remained in the world. Through the practice of poverty, chastity, and obedience, of which you renew today the vow, you will redeem your own cowardice, as well as that of the world. We are united to the monasteries of Randol and Clear Creek, where today solemn professions also take place, and we pray for our future professed monks.